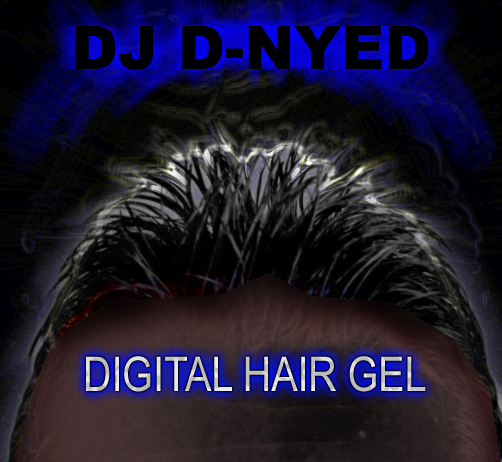 Digital Hair Gel, My First Album. Well, I've written music before this, but It's been lost, and rightfully so, it all sucked, this is where my music became less offensive to the ear. ------This song is a little darker, I was experimenting in trying to vary my style, I don't beleive this came out as different from my regular works as I would have preferred, however it did turn out decent enough to make it onto my finished works (Barely). ------This song is more of a cross attempt at ambient, dance, and film score. I am still not happy with the beginning and ending portions, but I can't think of anything more to do with it, so judge it for yourself. ------This song is a longer, more mellow mix, angled to be background music. I like this one. All it needs is some club lighting, and theatrical fog. ------This song is a little simpler in design, it's not intended to fill the head with any strong feeling of euphoria, but it is pleasing to the ear. ------My Friend (Who was also my room mate at the time) approached me one day asking me to help him find some music that he could play in the background for a valentines dinner between him and his girlfriend. After suffering frustration being unable to find anything suitable, I decided to try the unthinkable, and write it myself. Although it's not my style, it's decent. ------This song was origionally written as accompanyment to an Unreal Tournament Level. However when the song was completed I found myself listning to it outside of UT2K3 more often then in gameplay. This was unreleased until now. ------I dislike this song, I think mostly because It sounds too "Game Boy" to me, but most of the people I've shown it to enjoy it so I'm posting it here. ------This song was written by me while a friend of mine wrote the lyrics, we recorded the lyrics in house, but lost the recorded lyrics sometime after due to a storage media malfunction. We have not gotten together to re-record the lyrics since, so I'm releasing my music portion of the song stand-alone. ------This song just came out of a dream sequence that was running thru my mind, if you remember the old style computer graphic music videos, that's what it looked like in my head. ------I thought of a stop motion video of an insect walking thru our world, and watching how odd things looked from it's perspective, I know this music video idea has been done before, but I wrote this song as a platform to do it differently. ------This song was written with the input of a friend, similarly to "Convergence". The friend who deserves some of the credit calls herself SugarDemon. ------This song was written when I was extremely lonely one night, and the next morning, listening to the song made me equally lonely. As I publish this song, I'm most proud of it's consistent Ambient Feel. ------This song was sort of a spin off of "Life goes by", I wanted something similar, that sounded less hip-hop (Not that the other one sounded terribly hip-hop). I think it worked. ------This song was written originally to be a 30 second intro to a website, but when the website took a different path, I resurrected this into a full length song, I'm not entirely happy with this one, but some people like it so why not let anyone who wants to enjoy it, enjoy it.